New Zealand is listed as one of the top six countries in terms of numbers of sharks caught. A 1998 NIWA report, (Francis et al 1998) reported that the number of blue sharks, (Prionace glauca), caught declined from around 60,000-75,000 per year from 1988-89 to 1990-91 to only 25,000-45,000 from 1991-92 onwards. 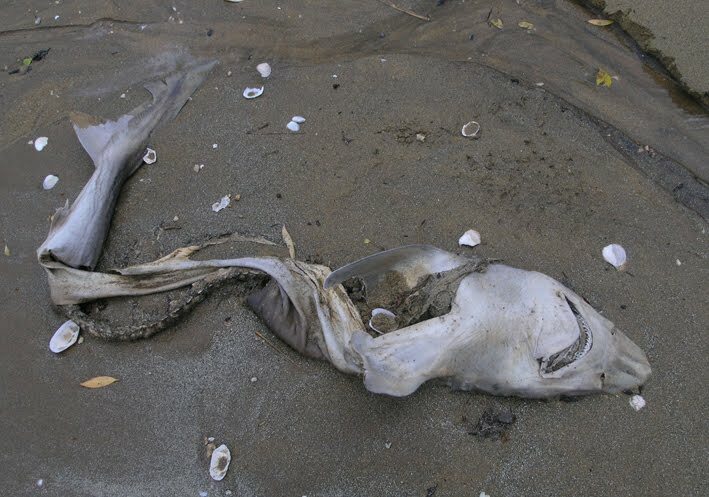 In many cases the sharks are caught, the fins cut off and the still living shark is dumped back into the sea to die. Of the 100 or so exploited shark species, 20% are considered vulnerable, endangered or critically endangered. No international treaties and management strategies exist for sharks fished on the high seas. There are shark fishing restrictions either in place or being set up in South Africa, Australia, New Zealand, Mexico, European Union, Canada, USA (only on the Atlantic coast), Brazil, Philippines, and Israel. While sharks may not be everyone’s favourite fish they have a vital part to play in the well being of our oceans. Their loss to ocean ecosystems will have effects that may not be known about today. Fisheries worldwide need to take stock of their catches. Shark fin soup is common on the menus of Chinese restaurants. To see how common, log on to Google and type in “shark fin menu.” Any prospective diner in a Chinese restaurant can help by having a close look at the menu. If shark fin soup is listed, explain your views on shark finning and find a Chinese restaurant that doesn’t list it.